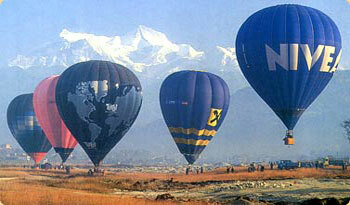 Hot air ballooning has over recent years become very popular with tourists, it affords the most spectacular bird’s eye view of the Kathmandu Valley and the Himalayan ranges towering in the background. On a clear day it’s a superb way to view the Himalaya (from over 6000m up), and the view of the valley is equally breathtaking. Please make contact with us to find out if your desired destination is available for flying.